Changing between local and remote email may happen if you have either opted to choose an external 'remote' service like Google Mail to receive your email, or you are stepping back from an external email service and wish to now receive your emails directly to your 'local' server. The following guide helps explain how you can switch between local and remote email. Once you have successfully logged in, scroll down to the 'Email' section as per the below. Select 'MX Entry'. As explained earlier, depending on your email preference, you may wish to change to 'Remote Mail Exchange' or 'Local Mail Exchanger' email routing. Here you can choose your preference simply by clicking the respective option. There is an option to 'automatically' detect the configuration, but in our experience this option is not reliable. Choose 'Change' to save the setting. 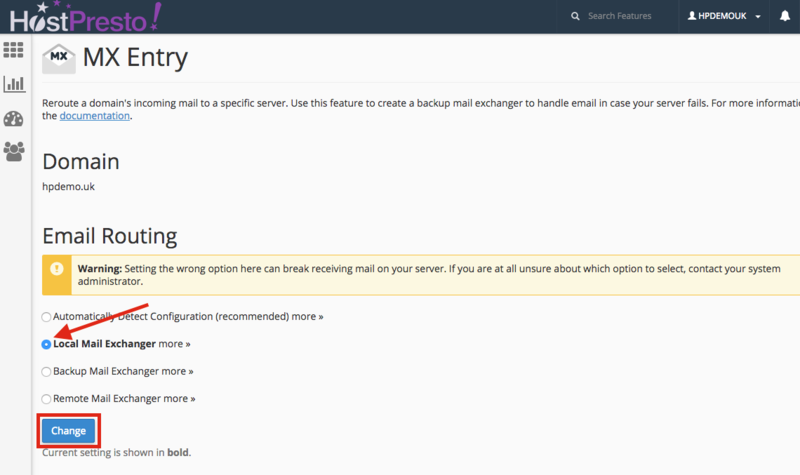 Changing between local and remote email is now complete.